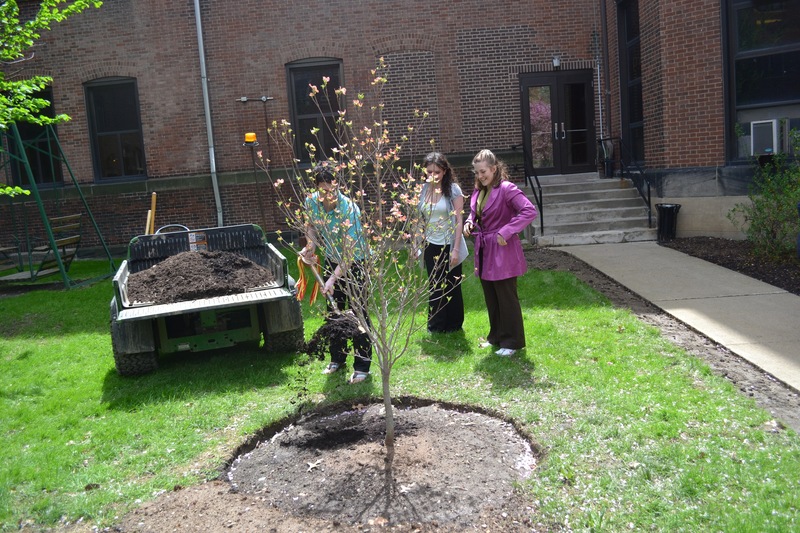 As part of Seton Hill tradition, the junior class plants a tree on campus each year. This year, the class of 2012 dedicated their Pink Dogwood to the and custodial and maintenance staff. The event was organized by the class of 2012 Student Government Officers. The class of 2012 held a dedication tree ceremony to commemorate the work of Seton Hill University’s [SHU] custodial and maintenance staff on April 28. Students, teachers, custodians and maintenance men gathered by Lowe Dining Hall. The class of 2012 chose to plant a Pink Dogwood to appreciate the staff. They planted it along the walkway from Maura to the Lowe cafeteria. Carol Zola, the administrative assistant, shed tears as the ceremony began. “The tree is simply beautiful. It reflects the beauty of not only the students, but also the people it’s dedicated to,” said Zola. Barnett led the dedication for the ceremony and junior officers Jaclyn Spoljarick, vice president, and Jessica Orlowski, secretary put the tree in place. Advisors Keisha Jimmerson and Jeremy George followed suit before allowing the crowd to assist in the planting. “It feels great to be appreciated on campus. They could not have chosen a better spot to plant this tree, everyone will be able to see its beauty here,” said groundskeeper Dave Bigenho. SHU plans to finalize the ceremony with the placement of a plaque.